Ski Utah CEO Nathan Rafferty races motorcycles. Long distances. On distant continents. And he’s pretty good at it. (Photo courtesy of Nathan Rafferty) Ski Utah president and CEO Nathan Rafferty became the first American to complete the 12-day endurance Africa Eco Race earlier this year. Nathan Rafferty’s first love is the mountain. The president of the non-profit Ski Utah works tirelessly to promote the state’s ski and snowboard industry. But lately, Rafferty has found his attention turning from snow to sand. Earlier this year, Rafferty’s hobby took him to northern Africa, where he became the first American to finish the grueling, 12-day Africa Eco Race — a 6,500-kilometer competition. The 46-year-old has competed in other endurance events. As part of a Ski Utah promotion, he once finished 60-runs during a 12-hour overnight event. Nothing Rafferty has done, he said, compared to his two weeks in Africa last January. “It was the hardest thing I’ve ever done,” he said. Rafferty grew up riding mountain bikes but wasn’t allowed to ride motorcycles because his parents felt they were dangerous. When he turned 30, he bought one for himself. Now he owns four bikes (“if you ask my wife, she’ll say we have way too many and if you ask me we’re just right,” he said) but he competed on a rented 2015 450 KTM Rally Replica. The Utah racer trained for the grueling competition at a crossfit gym in Park City, but said the mental aspect of the race was his greatest challenge. Over two weeks, Rafferty and his fellow racers traversed sand and desert across Morocco, Mauritania and Senegal. As he had prepared for the undertaking, Rafferty was often met with the same question: Why? Only one other American rider ever entered the race, Rafferty said, but he had to pull out halfway through with engine troubles. So when Rafferty crossed the finish line in sixth place out of the 33 riders, he had made a bit of history. Rafferty returned home, his head still buzzing from the concentration and effort he’d needed in competition, and soon realized his biggest takeaway. Maybe that explains his next plan. After finishing his race in Africa, Rafferty thought he’d checked a box on his bucket list, that he’d never do anything like that again. 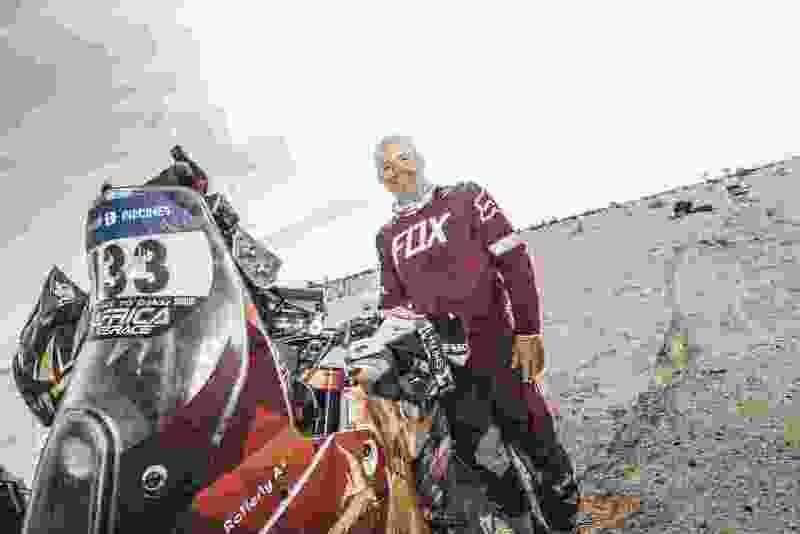 But he soon found himself looking at the sports other major endurance race, the Dakar Rally in South America this January.